Size 9 - $33.99 Only 3 left! Size 10 - $33.99 Only 8 left! Wouldn't it be great to have shoes that you could tap together and end up exactly where you want to be? *tap, tap* You're on the beach, ocean breezes blowing through your hair. Hmm, those red sequined shoes go surprisingly well with that chic black one piece! Getting sick of that beach ball knocking sand into your fancy iced drink? Feeling a little sun burnt? Tap those heels, girl! While most of us wouldn't wish to travel by tornado we all were jealous the instant we saw those sparkly shoes on Dorothy's feet, even before we learned of their transportation abilities. After all, who knew that red sparkles would go so well with blue gingham! 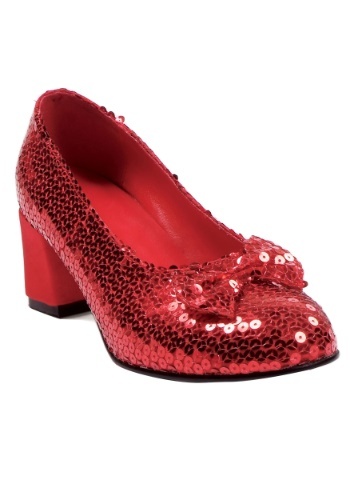 Not only did those shoes provide Dorothy with instant and free air travel, they made her a fashion icon. Now, these shoes can't bring you home in a matter of seconds but they can provide you with a splendid look that'll bring your whole costume together. Sparkly enough to catch the eye but comfy enough to skip down any road you so choose be it brick, asphalt, or otherwise.